The critics are loving DC's latest hero and his sidekick. Could Shazam! top Wonder Woman to be the Freshest DCEU offering yet? 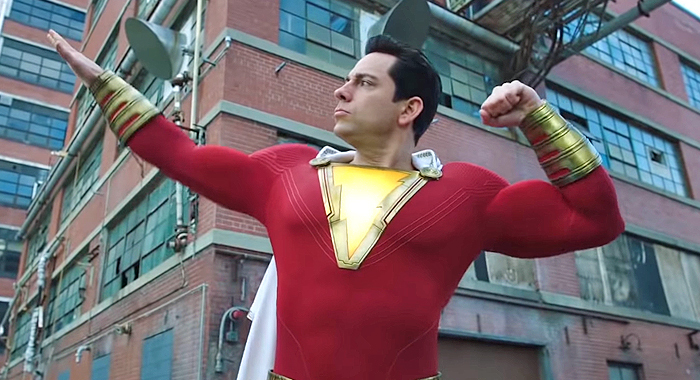 The first reviews are in for DC’s Shazam! and “Fresh” is the magic word – very Fresh, in fact. 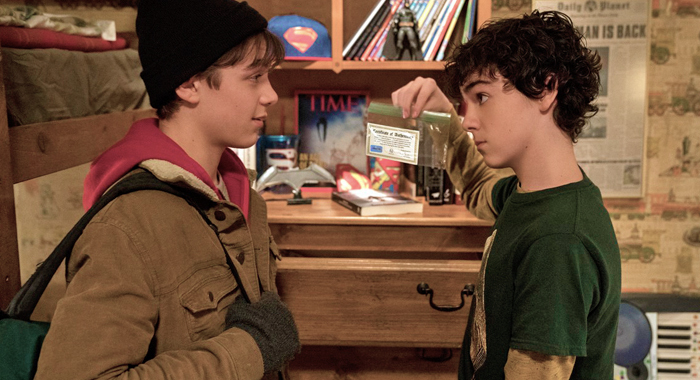 The story of Billy Batson’s (Asher Angel) discovery of his inner superhero – which critics are calling the lightest, most fun, and most kid-friendly of the DCEU offerings so far – is currently sitting at 94% on the Tomatometer with 47 reviews counted [as of Sunday, March 24, 10am PT]. Early reviews are praising director David F. Sandberg and writer Henry Gayden for creating a superhero flick that is giving off warm and fuzzy Amblin vibes while still providing the thrills that DC fans demand (and some genuinely dark thrills, thanks to Sandberg’s background in horror – he directed Lights Out and Annabelle: Creation). What are they saying about Zachary Levi as the titular hero, Mark Strong as his nemesis, and whether this might be the best DCEU movie yet? Read on to find out. LET’S GET TO IT: IS SHAZAM! AS GOOD AS WE THOUGHT IT WAS GOING TO BE? Holy superhero fatigue, Batman, Shazam! is actually good. “Why couldn’t that movie have been more fun?” You might have said that about some past superhero movies that have hit theaters. But you won’t be saying it about Shazam! Warm, witty, and bursting at the seams with great characters, Shazam! is easily one of the most fun superhero movies ever made; even after the euphoric Spider-Man: Into the Spider-Verse, that’s still a low bar to clear, but it’s worth celebrating all the same. How does it compare to other DC movies? Shazam! is a welcome antidote to the usual brooding DC fare, an upbeat superhero movie that feels young at heart. If the Wonder Woman and Aquaman movies represented DC Comics’ first big-screen steps away from the austere color palette of the Zach Snyder movies, Shazam! takes us deeply into primary colors in a single bound. Shazam has less in common with the grim, grisly world of Batman v Superman and the indulgent marine opera Aquaman, sharing more with the likes of Harry Potter and a certain teenage superhero from a rival comic book company. But It Sill Exists in the DCEU, RIGHT? Shazam! doesn’t waste a second letting you know this story takes place in the same world where Zod once brought a war to metropolis, Batman protects the nights of Gotham or even Aquaman rules the seas. Superman is chief among them, with name drops practically every few minutes. It’s different and lighter in tone, but how? 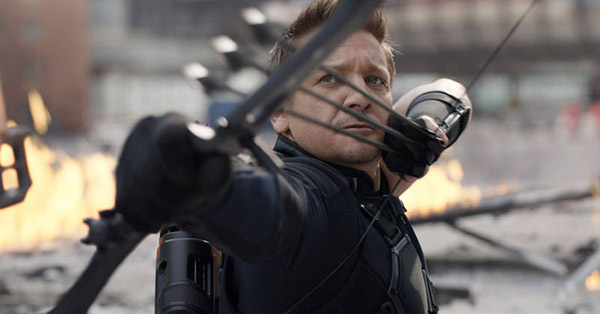 …there’s a great, grinning tradition of demigod-in-spandex movies that don’t take themselves seriously. 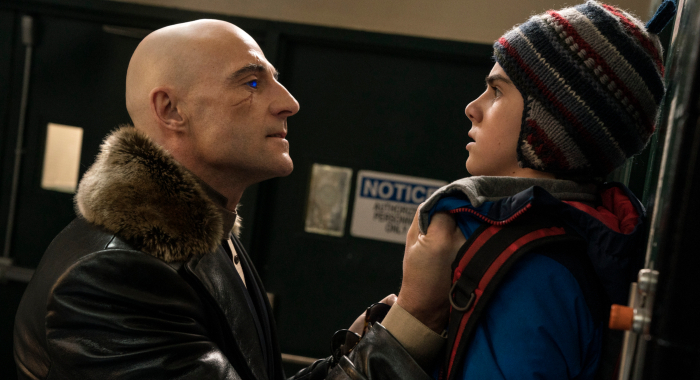 But maybe the reason Shazam!, in its fluffy-tasty origin-story way, feels like a perfectly timed tonic is that the universe of comic-book movies — not just the Marvel Cinematic Universe, or the DC Extended Universe (of which this is technically a part), but the whole omnivorous universe of big-budget comic-book films that is now threatening to eat cinema, if not our souls — has grown so top-heavy with its own fateful importance. 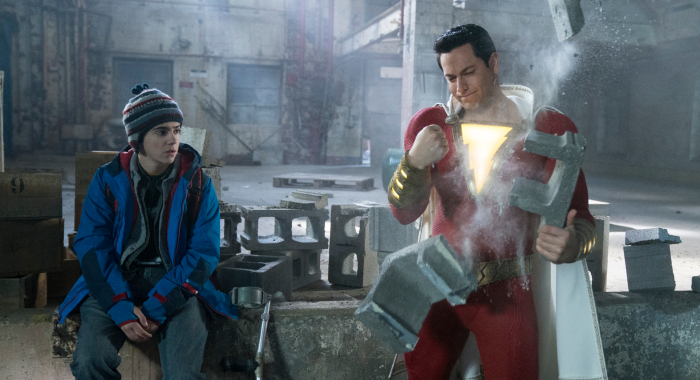 For large parts of the movie, Shazam unfurls like a holiday movie spin on the genre. 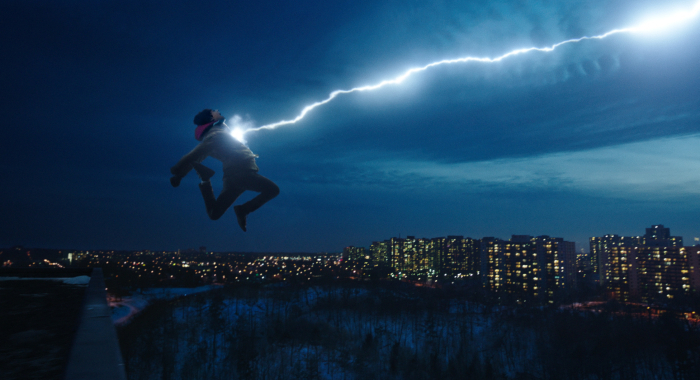 And in embracing earnest glee and heartfelt tenderness, Shazam allows us to fully appreciate the magical excitement and wonder that superheroes can supply. [Director David F.] Sandberg has compared the movie to the teen-friendly Amblin Entertainment movies of the 1980s (E.T. the Extra-Terrestrial, The Goonies, Back to the Future) — the production company created by Steven Spielberg, Kathleen Kennedy, and Frank Marshall — and there’s a lot of truth to that. 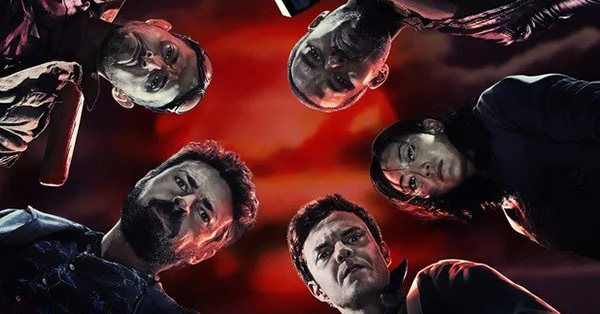 OK, so it’s basically Big with superheroes and villains instead of businesspeople and girlfriends, but director David F. Sandberg has infused his film with so much heart and charm that it hardly matters. How is Zachary Levi as the DCEU’s Newest hero? [Levi] plays the title character with an infectiously naïve, gee-whiz charisma that calls to mind Tom Hanks in Big more than anything…. Whenever Levi is on screen, wowed by his new grown-up physique (his muscles seem to have muscles) and shocked by his newly discovered powers (living lightning zaps from his fingertips), the movie soars. Levi’s body language is constantly inventive, as he plays a tween who still isn’t used to a grown man’s body, let alone a superhero’s. But the cheeky, balsa-wood trick of Levi’s performance is that he’s not making fun — he’s totally sincere. It’s just that he’s playing a superhero with a major case of imposter syndrome. …for a guy not named Chris, he makes a pitch-perfect do-gooder. There’s a youthful wonder and innocence he captures as the Frito-chomping man-child hero, and he has all of the facial expressions and flossing skills (the dancing kind rather than the dental) to convey the pure excitement of a boy learning he can pretty much do anything. It’s unfortunate that Levi plays Shazam even younger than Angel plays Billy, and without even a sniff of empty stoicism — it often feels like Levi isn’t possessed by a teenager so much as he’s performing at a child’s birthday party — but overemphasizing the concept of their shared character has its perks. How is the Villain, Dr. Sivanna, played by Mark Strong? After being the only shining part of 2011’s Green Lantern, Strong effortlessly fills the role of Dr. Sivanna. While not the strongest villain the DCEU has seen so far, the character does a solid job being an opposite to Billy Batson. Strong’s melodramatic performance, contrasted with Billy’s more grounded tone and humor, makes for some of the film’s most entertaining moments. Fans of those comics might not recognize this Sivana, much taller and more handsome than the creepy mad scientist of the original, and even though Shazam! doesn’t give us any talking tigers, there are some hints that one of the series’ most ridiculous yet most beloved villains will be popping up in future installments. Are there other standout performances? Billy’s foster brother and resident superhero expert Freddy (Jack Dylan Grazer, the clear standout of the young cast). One of Shazam!‘s most delightful surprises is its young cast, who play their characters not as precocious movie brats but as real three-dimensional individuals with their own idiosyncrasies. The young actors assembled here are astounding, and immediately captivating, especially Grazer as Freddy and [Faithe] Herman as Darla who nearly steal the show. It’s why when the film asks you to believe that it’s really about family, and not merchandising, you’re on board. Wait, we might cry during this DC movie? From the moment Billy walks in the door of Victor and Rosa Vasquez’s (Cooper Andrews and Marta Milans) crowded foster house, you hope that it will become his forever home. There’s a palpable, Hollywood-calibrated warmth to that place, and everyone under its multicultural roof is essential to the mix. The film takes seriously the challenges of childhood and adolescence, and the long-ranging effects of early traumas. Billy’s messy feelings about finding a new family, after losing his mother years ago, are given every bit as much weight as his journey toward becoming a true hero. Shazam! works because of its emphasis on friendship and family: Mrs. Vasquez has a bumper sticker that reads “I’m a foster mom: What’s your superpower?” that sums up the film’s overall warm-hug vibe. Shazam! might be the most heartwarming superhero film since Sam Raimi’s Spider-Man films. Director David F. Sandberg has a horror background: How does he do in the superhero genre? Sandberg has a great visual eye and it really shows. And with his horror background, he’s able to incorporate tension when needed and work in a couple of jump scares. Sandberg’s coherent, tactile direction also harkens back to a time before every fantasy movie was pre-vizzed within an inch of its life. Sure, there’s plenty of digital effects work, and much of it shows the strain of the movie’s relatively meager $90 million budget, but even the biggest setpieces are layered, character-driven, and littered with solid grace notes. Director David F. Sandberg made his name in horror (Lights Out, Annabelle: Creation) before helming Shazam! and it shows, in that he’s perhaps too effective at making the monsters scary. Those watching with younger or more sensitive children will want to exercise caution. But it’s not perfect, right? At times, particularly in the third act, the visual effects are not as polished as prior DCEU films, easily attributed to the smallest budget the franchise has seen thus far. Where Shazam! struggles is in some of the more dramatic moments, particularly Billy’s backstory about how he became part of the foster system and his search for his mother. It’s all necessary to his character arc, but certain scenes feel more contrived to move that emotional storyline forward than provide any real pathos. Shazam! is basically two movies in one. One with Levi and his wiseass foster brother (a fresh Jack Dylan Grazer), the other with Strong and all his snarling, computer-generated gobbledygook. And they both have the other in a headlock, wrestling for the soul of the story. So, DC is continuing its winning streak? What a thing, these current DC movies. A movie like Justice League, which has all the “big name” characters, is atrocious. Yet movies like Aquaman and Shazam!, lower grade characters, but have some personality to them, are enjoyable. And now Shazam!, of all things – a 1940s Superman clone that, now, can’t even use his own name – sits atop the recent DC movie heap alongside Wonder Woman. Shazam! opens everywhere on April 5.